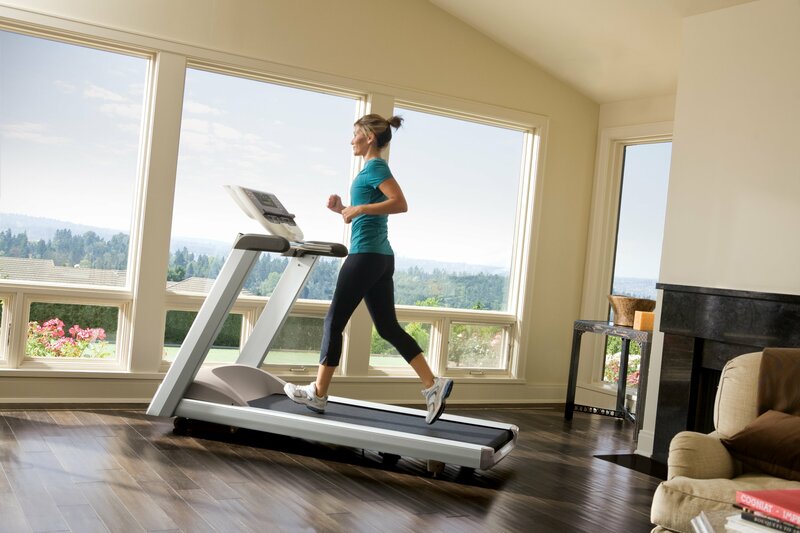 The Precor Premium Series 9.31 Treadmill is a professional grade treadmill built for home use. It is equipped with a specialized suspension system that minimizes the impact on joints and reduces fatigue. The belt adjusts to foot speed to provide comfort whether walking or running. The treadmill offers 8 preset workout programs as well as options for customizing workouts. A two-color LCD backlit display tracks speed, time, calories burned, distance and more. It provides speed settings from 0.5 to 12 mph and an incline of up to 15 percent. The Series 9.31 has a maximum weight capacity of 350 lbs. It weighs 335 lbs. and its dimensions are 79 L x 34 W x 56 H inches. The latest models were released in the fall of 2013 and are priced at approximately $3,999.00. The treadmill is built with high quality materials. The frame is constructed of durable steel and is powder coated. Steel crowned rollers help keep the belt centered to reduce wear. The belt is composed of multi-ply polyester satin weave and dry silicone lubrication makes it maintenance free. Its deck is composed of 1inch, medium density fiberboard bonded to phenolic laminate. It can be turned over to double the life. The continuous duty motor is quite resilient and doesn’t drag, even when the treadmill is inclined. It runs quietly and does not rattle when in operation. LEDs used to illuminate the console provide extended life as well as low energy consumption. The Series 9.31 has been used at health facilities around the world and proven to be well-constructed and reliable. The Series 9.31 Treadmill requires assembly. It is extremely heavy, and Precor recommends that it be professionally assembled and installed. They will provide service upon request. Precor has a network of trained installers around the world. However, the treadmills come with a set of Allen wrenches, and a number of people have reported assembling it on their own with little difficulty. It is also equipped with wheels on one end to assist with moving. The Precor 9.31 Treadmill is an exceptional choice for those searching for a high quality treadmill to train at home. It offers a durable frame, quiet operation and exceptional safety features. Its unique design provides comfort and negates injury. Although it is a bit more expensive than other treadmills, it offers reliability and performance that is backed by a life time warranty on the frame and welds, a 10 year warranty on parts and a one year warranty on labor.